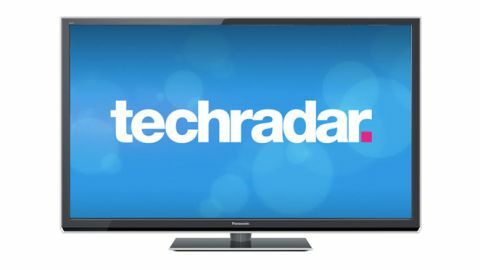 Plasma, it seems, is continuing to lose the PR battle with its arch LCD rival - at least where the mass television market is concerned. It hasn't helped, either, that the new energy rating system for TVs doesn't exactly work in plasma's favour, with most plasma TVs measuring Cs at best versus the A and A+ grades routinely boasted by LCD TVs. The Panasonic P50ST50, though, is out to prove that plasma still has a big part to play in the modern TV world. For starters it looks surprisingly svelte for a plasma set, proving that the technology doesn't have to be fat and old-school. It's also got some fearsome specifications to shout about, including a mind-boggling 5,500,000:1 native contrast ratio (no dynamic contrast backlight shenanigans here), a response time of just 0.001ms that destroys the response times of all LCD TVs, not to mention such up to the minute features as active 3D playback and a healthy online feature set, courtesy of Panasonic's Viera Connect platform. Perhaps even more importantly, the plasma panel at the Panasonic Viera TX-P50ST50's heart is a radical reboot of last year's debut NeoPlasma panels. This delivers - in particular - improvements to energy efficiency that Panasonic has bravely used to help the TV deliver more picture brightness, rather than taking the more politically correct route of just going for a lower energy rating. The 50-inch Panasonic P50ST50 is priced at around £1,200 in the UK and $1,400 in the US. It's joined by the 65-inch Panasonic P65ST50, 55-inch P55ST50, and 42-inch P42ST50. As for rivals, Samsung and LG are both still in the plasma market alongside Panasonic, with the upcoming Samsung P51E6500 looking to be the closest match in price and specification terms. LCD alternatives are 10 a penny really, except that LCD panel size trends mean you'll be looking at 46/47-inch or 55-inch sizes rather than the 50-inch screen of the Panasonic P50ST50. The single most important thing to know about the Panasonic P50ST50 is that it uses plasma rather than LCD technology - a fact that instantly generates a series of expectations about where its performance strengths might lie. Contrast is generally an area of real strength for plasma TVs, especially Panasonic models. And this trend looks like it's going to continue on the Panasonic P50ST50 if its vast quoted contrast ratio of 5,500,000:1 is anything to go by. This is a 'native' contrast ratio figure too, meaning that it isn't achieved by dynamically shifting the overall image brightness (and thus reducing image stability and the dynamic range of dark scenes) as happens with LCD TVs. We'd also expect a plasma TV to show fast motion more clearly than LCD TVs, on account of plasma's much faster screen response time. Plasma screens also support viewing from much wider angles than LCD ones. Indeed, during our tests you could sit almost at right angles to the Panasonic P50ST50 before the image degraded to any significant extent. Experience would suggest, too, that the Panasonic P50ST50 should be able to show its active 3D pictures with significantly less crosstalk ghosting interference than most LCD TVs. But while we're on the subject of 3D, it's a little disappointing to find that Panasonic doesn't include even a single pair of active 3D glasses for free with the Panasonic P50ST50. Presumably Panasonic took the decision that it wanted to keep the P50ST50's price as low as possible rather than charge more to include a set or two of the £60/$80-ish active 3D glasses. But experience and consumer research suggest that unless people can enjoy a TV feature right out of the box, they're much less likely to ever try that feature at all. Plasma technology isn't all about benefits, of course. You would also expect plasma TVs to be less bright than LCD ones - even though they use markedly more power. Panasonic doesn't quote a brightness figure for the Panasonic P50ST50, but its quoted average power rating of 180W is up to three times as high as the figures quoted for some of Panasonic's own LCD/LED TVs. Panasonic TVs struggle to deliver the same highly fashionable ultra-thin looks that LCD TVs can, too. However, while the Panasonic P50ST50 certainly isn't nearly as svelte in either its bezel or its rear end as the latest LCD supermodels from LG and Samsung, it's still pretty attractive in its dark grey colour scheme, offset by a trendy see-through accent along all four of its edges. Certainly it's a big improvement over the rather dull aesthetics of most previous Panasonic plasma TVs. The Panasonic P50ST50's connections show few signs of any 'old-fashionedness' either. For instance, its three HDMIs are all built to the latest 3D-supporting v1.4 standard, and it's got two USBs through which you can play a good set of multimedia file formats. The support level here is much higher than it was with last year's Panasonic models, with all of the following file types now in play: JPEG, AVCHD, SD-Video, MOV, AVI, DivX, MKV, ASF, MP4, FLV, 3GPP, MP3, AAC, WMA, FLAC, PS, and TS. Do note, though, that you'll need to run Windows 7 as a media server for a few of these formats. Any mid-range or higher TV now is likely to have some sort of online functionality, and so it is with the Panasonic P50ST50, which provides both LAN and built-in Wi-Fi options for logging the TV into Panasonic's Viera Connect online service. You can also, of course, employ both these options for streaming files from a connected DLNA PC. Viera Connect's appeal continues to grow, slowly but surely. The single most significant addition to it this year, to date, is the Netflix movie streaming subscription service, which joins the likes of BBC iPlayer, AceTrax, Fetch TV and YouTube in providing you with on-demand video servers. Viera Connect is also to be commended on having secured a couple of startlingly good-looking games from Gameloft (Asphalt 5 and Let's Golf 2), and for covering all the key social networking bases. There's a growing number of small (and thus less actually useful) apps too, although the number of these isn't as distractingly overwhelming as it is on the latest smart TV services from Samsung and LG. Panasonic has got considerably better in recent times at making sure its TVs have the sort of calibration tools desired by the enthusiast end of the AV market. The adjustments on the Panasonic P50ST50 aren't bad by any means, and include gamma and white balance fine-tuners. But you don't get the full colour management options - or THX endorsement and presets - found on the Panasonic's higher-spec GT50 and VT50 plasma TVs. The plasma panel inside the Panasonic P50ST50 is one of Panasonic's very latest designs. Indeed, the ST50 range is the cheapest point at which you can get your hands on one of these panels. What this new panel does, predominantly, is improve colour balance and black level response while also driving down energy consumption. Intriguingly, Panasonic claims to have put this increased efficiency to use in boosting the P50ST50's brightness rather than simply pursuing a reduced overall energy consumption rating. Why? Because it sees plasma as the picture enthusiast's choice, where a likely buyer will prefer more picture dynamism to saving a few bob on their electric bill. If you want to go down a more eco-friendly route, the argument continues, then there's always Panasonic's A-rated LCD TV range. Also of note on the Panasonic P50ST50's spec sheet is its 2000Hz Focused Field Drive technology. This is a vast improvement over the 600Hz systems previously found on Panasonic's plasma TVs - and actually, so far as we can tell, 600Hz remains the maximum figure employed by any rival plasma brands this year. What these fancy numbers all mean, hopefully, is that the Panasonic P50ST50 will suffer considerably less with judder than typical plasma televisions, as well as enjoying enhanced brightness and colour saturation.